ANNAPOLIS, MD (April 1, 2015) – Exotic earthworm species in the eastern U.S. provide an additional stressor for mature and successional forests already affected by disturbance, climate change, invasive insect pests and diseases, and overabundant white-tailed deer. Where native earthworm species were extirpated due to glaciation, or in areas of permafrost farther south, exotic earthworms have colonized, even as native species repopulate these areas. Because “April showers” are likely to bring worms to the surface, MISC has chosen exotic earthworms as the April Invader of the Month. Most of us are familiar with the long, dark reddish-brown worms commonly called nightcrawlers. Many people don’t realize that these worms are native not to the U.S., but to Europe. 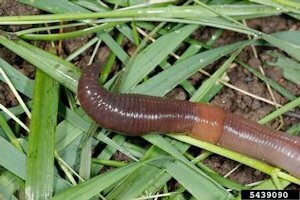 Exotic earthworms arrive in the U.S., primarily in soil and “plant-associated materials” in conjunction with agricultural and horticultural products. They are deliberately imported for composting, degraded soil restoration, or bait. They migrate from lake and river shores into forests when released from live bait buckets. There are over 100 species of native North American earthworms north of Mexico, and about 45 exotic species. The introductions include species from all over the world, but most of them are from Europe and Asia, due both to heavier commercial exchange with those regions, and to climatic matches between the eastern U.S. and those areas. 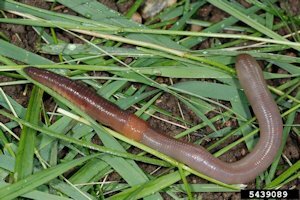 Although earthworms all look pretty similar – they range from under a centimeter to, in the case of giant earthworms, several meters in length. They are tubular, with a head, a long, thin body made up of segments like stacked rings, and a “tail,” more correctly called a <em>pygidium</em>. Surrounding a worm’s body, closer to the head end, is a thickened non-segmented band called a <em>clitellum</em>. The clitellum secretes a thick fluid that covers and protects fertilized eggs, which can develop in both members of a mating pair, since earthworms are hermaphroditic. Earthworms are divided roughly into three groups depending on where in the soil they live and what they eat. <em>Epigeic</em> (“on” or “above” “earth”) worms live primarily in leaf litter on the forest floor and eat microbes. <em>Endogeic</em> (“in-earth”) worms live at or near the soil surface and eat soil in the top 4” of ground. <em>Anecic</em>worms, like the familiar nightcrawler, are burrowers, and build vertical burrows, eating litter and soil. The three types of worms, and the intermediate subcategories between them, have different pigmentation patterns and sizes. The same behavioral effects that can make earthworms so desirable in your garden – incorporation of organic material into the soil, increases in soil porosity and water infiltration, stimulation of microorganisms that can aid plant growth – are detrimental in forests. Earthworms remove the forest duff, or leaf litter, either by eating it or by burying it. This leaves the floor more susceptible to erosion and drying out, removes food substrates for above-ground decomposers, and mixes the organic and mineral soil horizons. Changes in litter decomposition rates change with the composition of the earthworm community, and the tree species (tulip poplar leaves are easier to eat, and apparently tastier than tannins in oak leaves), but more earthworm activity means a barer forest floor. Earthworms also eat plant seeds. For larger seeds, going through an earthworm gut may help break dormancy, or bury a seed away from its surface predators. But smaller seeds may be damaged in gut passage, or may be buried too deeply to germinate. One group of Maryland researchers found that rattlesnake plantain orchid seeds – among the smallest in our flora – were buried by earthworms deeper than the mycorrhizae they require to germinate were present. In this way, worms change the nutrient availability for orchid seeds. Earthworms decrease the abundance of mycorrhizal fungi in general, which can reduce the growth of tree seedlings that need these fungi to thrive. However, in a study in New York forests, earthworm presence did not affect the survival, growth or reproductive capacity of several forest wildflowers, but did reduce the growth of two species of forest sedges. While research findings are somewhat contradictory, it is clear that earthworms change the amount and speed of nutrients in forest systems. Carbon, nitrogen and phosphorus flows all change in the presence of exotic earthworms, in complex and not entirely understood ways. At its most fundamental level, this results in changes in how forest plants and animals get their food. Exotic earthworms may be in eastern forests to stay. Reducing their populations is more likely through prevention than through outright control. For example not discarding unused worms for bait in the forest. While USDA regulates earthworm importation under the Federal Plant Pest Act, the focus is on prevention of pathogens that imported worms might carry, and not the worms themselves. Various policies for limiting earthworm importation are still under discussion. Recent studies indicate that exotic earthworms and exotic plants may go hand in hand. In the southeast U.S., more exotic than native earthworms were found under invasive Chinese privet, a shrub that caused a rise in soil pH. Removal of the privet resulted in a reversion to the lower soil pHs, a decrease in exotic earthworms, and a return of native earthworms. Perhaps the best control technique for invasive exotic earthworms is NOT TO PLANT invasive exotic plants! Invader of the Month other invertebrates. permalink.